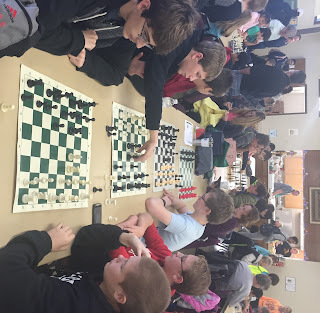 The Scenic Moraine Chess Association (SMCA) open the season with 3 matches held at New Berlin West High School. This club is comprised of 7 high schools in the area and our Muskego team played 3 of them this past Saturday. We'll play 1 more in January and finish against the remaining 3 in February to round out the season. Our team lost the first round (just barely!) to New Berlin Eisenhower, WON the second round again Hartford, and lost the third round to Kettle Moraine. They were G60 games and many were very good match-ups. First off, the club needs to thanks LDMS and especially Mr. Nagy for allowing us to hold the tournament there & for all the help setting it up. Secondly, a big THANK YOU to all the volunteers who helped put this together, especially Leah & Dan G for getting the food & setting up concessions, and to all those who helped run the concessions during the day. Thanks also to Mike B, Aaron K and Ryan O for keeping the club room in order during the day and helping analyze games in between rounds. Without all the volunteers this great event - our biggest fundraiser - would simply not happen. And lastly, thanks to Mr Matt and his IAC group for yet another well run event! This continues to be a great event for the club and I believe a great event for the MNSD and Muskego as well. - Grace S attending her first tournament and getting her first win! - Alex S getting 3 points and finishing 13th, Steven A. also getting 3 points and finishing 11th, and along with Michael S taking 3rd place as a team for Bay Lane! - Brayden playing in his first tournament and getting 2 wins for Lake Denoon! - Andy P also playing in his first tournament and getting 1.5 points! - Logan O for getting a perfect 5 points and taking first place, quite an accomplishment! Logan & Andy took 5th place team for Mill Valley! - Alyssa P led the charge for Bay Lane with 3 wins and took 7th place! David B and Adam P had wins and along with Brody B, the team took 4th place. - Kenny M led the way for Lake Denoon with 2 wins, and Collin M and Nelson K played some hard fought games as well. - Will S. let the way for MHS with 3.5 points and finished 2nd place! Jacob G had 3 points and finished 8th place. Aaron G had 2 wins, and Grant B, Tom D and Nathan N, also playing in his first tournament, all had wins. It was a great team of 6 players and together they took first place!! We saw a LOT of hard fought games, a lot of team spirit & good sportsmanship that represented our club and city well. Congratulations to all!! If you bake anything, please make sure it's individually wrapped & doesn't have nuts. While we had some students attend the Holy Trinity event a week ago in Oconomowoc, this weekend kicked off the season for a larger group at University School Milwaukee. The MSCC brought 12 players to the event which made it a nice turnout. There is always of lot of competition at this event and all sections were USCF rated, making it a more challenging day for many, but there was a lot of good play. I'm happy to see more players are getting better at taking notation - something that we focused on for this tournament and will continue to do so in other tournaments. Remember, taking good notation and then replaying those games to learn from our mistakes is the best way to learn and grow!! In the K3 section, Rishi was the only participant. In the K6 section, Collin and Nelson were a team from LD and finished 11th and 7th place! Nate, Sarah and Steven made up a BL team. Yashika had a very nice day w/ 4 wins and took 5th place! 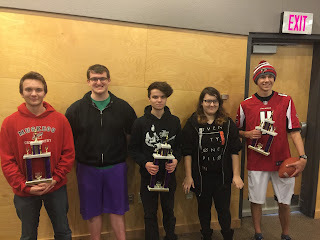 And lastly for the K12 section, Kenny was the only LD player, Will and Aaron were the MHS team and had some nice wins, taking the 5th place team trophy, and Adam and Alyssa were the BL team taking 4th place team trophy! Alyssa had a very nice day with 3 out of 4 wins and took 7th place! It was great to have such a nice Muskego presence at this great tournament. We're really looking forward to an even bigger turnout at the next one, our own!! Remember, no chess class this week. Happy Thanksgiving to all! Enjoy the time off and see you on the 30th!! Tomorrow (Wed 16) at 6 pm, the Pizza Party begins. We ask for $5/person & to start out w/2 pieces (to ensure everyone gets some). If you'd like to bring a side, salad, etc., please feel free to do so. This is open to the chess players & families. Also do tomorrow is the Chess Apparel Order Forms. December 3 is coming around & that's when we'll be hosting a tournament at Lake Denoon. If you're willing to help & volunteer w/set-up, running the concession stand, clean up, etc., please let Mr. Schantz, Mr. Bundy or myself know. Thanks! And we'll see you tomorrow!! 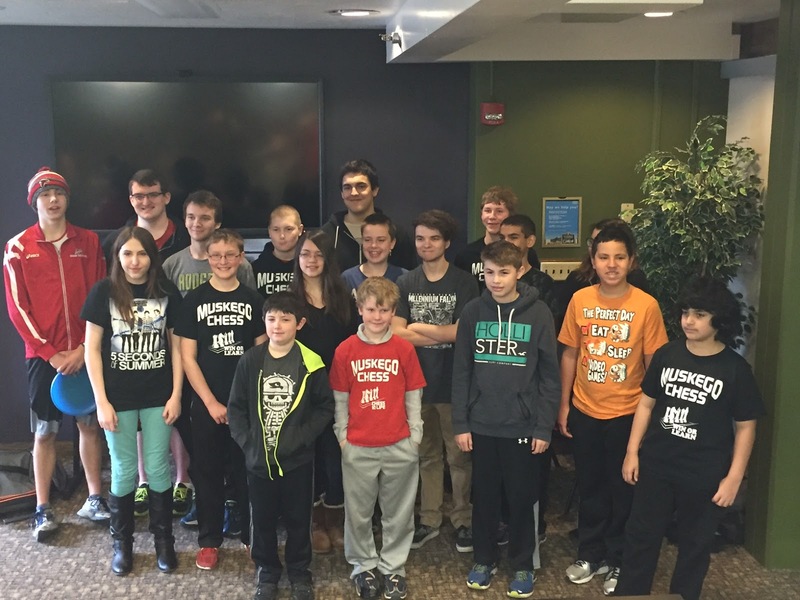 The MSCC kicked off the tournament season by bringing 6 players to Oconomowoc this past Saturday. It was a of good chess & learning for all! Special shout-out to Grant & Brody Bane for attending their first tournament and get their first wins!! Way to go guys! Aaron Gibbs took 4th place overall with 4 out of 5 points! Will Schantz was the lone MSCC player and took 3rd place overall with 3 out of 4 points! Next up: USM on Nov 19 and of course our own MSCC tournament on Dec 3 @ LDMS! Let's get signed up for these & bring a big group - talk to Dan, Mike or Leah if any questions. EDITOR IS TECHNOLOGICALLY CHALLENGED AND COULD NOT GET PHOTO ROTATED!!!! I will also bring copies of this to the next couple of classes. · Any tournament section that is considered “rated” has been previously approved by the USCF and the player will have a rating from that tournament. · Memberships can be purchased online at USCF or sometimes right at the tournament. · These ratings are recognized across the US. 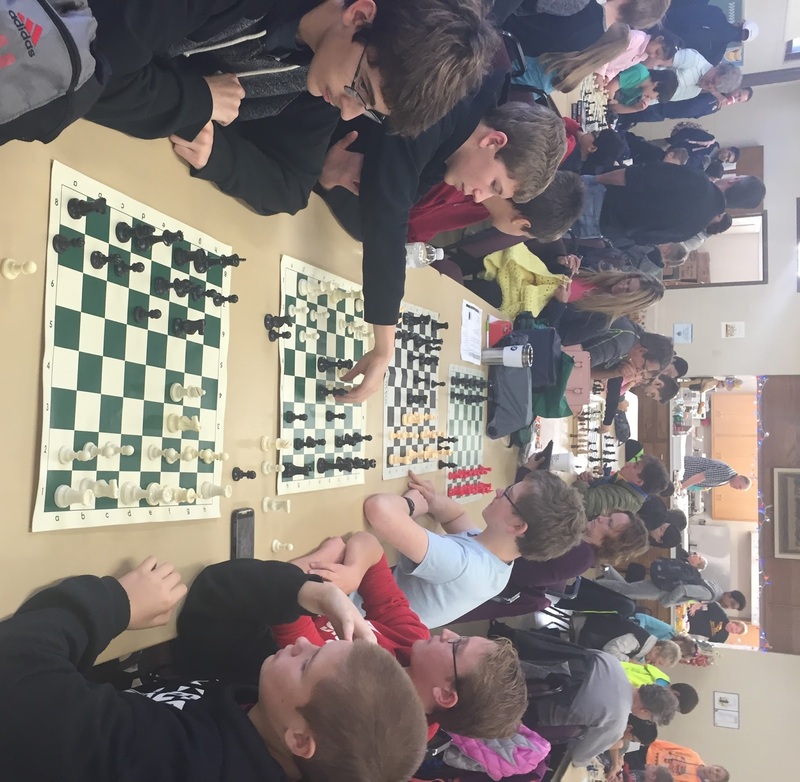 Typically the stronger, more serious players will seek out USCF-rated tournaments over local clubs, but these are still suitable for all ages & abilities. · http://www.uschess.org/tlas/upcoming.php?STATE=WI. This link allows you to search for USCF-registered tournaments in Wisconsin. Note that there could sometimes be a slight delay between this website and what is announced. · Depending on the sponsor there may be different sections – some rated and some unrated. Rated require a USCF membership. · Players sign up individually but also play as a “team” if they are in the same grade section and the same school (e.g. from Bay Lane K-6, not just MSCC). · Players sign up individually but most times can also play as a “team” even if not the same school, e.g. Baylane K6 and LDSM K6 would be on the same team. For the WSCF, we sign up as MSCC. 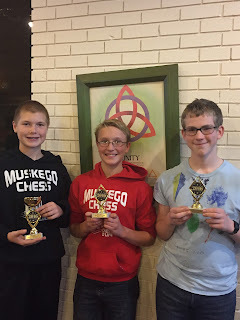 · http://www.wischess.org/ for to sign up. mike.nietman@charter.net for questions. · Provides instruction and runs tournaments, like the one in Oconomowoc on Nov 12th. Now is the time to order your Chess Apparel. We will have order forms at the club on Wednesday nights. If you'd like to have it emailed to you, please let me know. $2 from every item supports the club (except the jackets) & it's a great way to show team spirit! Orders are dues November 16. Speaking of November 16, we'll be having our pizza party! Both this & the Chess Apparel are fund raisers for the club. It'll start at 6 pm on Wednesday, November 16. This is open to the chess players & their families. If you would like to bring anything, please let me know. We ask for a donation of $5 per person & that you start out with 2 slices of pizza (just to make sure there's enough pizza for every one). Tournaments are starting to come up. Feel free to ask Mr. Schantz, Mr. Bundy or myself if you have any questions. This weekend there's the WI Junior Open in Oshkosh. After that is the USM Tournament (put on by IAC). Both tournaments are fun. And please save Saturday, December 4. That's the tournament we'll (MSCC) be hosting & that's our biggest fundraiser. It'll be held at Lake Denoon & we'll need volunteers. Please stay tuned. The last Open Play of the summer will be Wed, July 27 at the library from 6:30 - 8 pm. As a club, we will also not be doing Jammin (August). Thank you to all those that have helped during the summer. Remember to keep practicing chess & we'll see you in the fall! Now that Summerfest is over with, Open Play will resume tomorrow night (July 13) at the Muskego Library from 6-:30 - 8. There will also be Open Play Wednesday, July 20 & July 27 at the same time. Hope to see you there! **Don't forget tomorrow, June 15 starts the "Open Play" at the library from 6:30-8. I can't believe Jammin on Janesville is this Friday already. If you're willing to help out, please sign up. We will be in the library's parking lot so please stop by & say hi! Also, we will have the summer classes again at the library on June 15, June 22, July 13, July 20& July 27 from 6:30 - 8 pm. Please help volunteer for this. No need to know how to play chess, it's more of a "supervisory role". August 5 is Jammin on Janesville. The link to sign up is http://www.signupgenius.com/go/10C0B4EAFA928A3FF2-chess. If you have any questions, feel free to contact me at leahmike@ymail.com. Just as promised, here's the sign up link for Jammin on Janesville (June & August) & the library classes (June & July). Karla, thank you for creating the links. Please considering help out with at least one activity. Thanks & see you soon. I hope you've been enjoying your break. Sign-up links along with details will be coming soon but in the mean time, please put the following dates on your calendar. Any & all volunteers are greatly appreciated. If you have any questions, don't hestiate to contact me. We will also be at Jammin on Janesville in the library parking lot on June 3 & August 5. Volunteers would greatly be appreciated. I'll make up a sign up sheet sometime soon. Don't forget we also have the library classes (no instruction, open play) on June 15, June 22, July 13, July 20 & July 27 from 6:30 pm - 8 pm. We will need 1-2 voluntters a night for that as well. I'll be creating a form for that as well so please stay tuned. Have a good summer & if you have any questions, please don't hesitate to ask myself, Dan Schantz and/or Mike Bundy. Muskego High School finished the season with a bang, winning the SMCA conference with an 8-1 record! Our players of Evan, Jason, Reid, Rachel and Jake started the day 6-0 in the final meet and facing a difficult 4-2 Brookfield Academy (who had had missing players a couple times to contribute to their losses). They surprised us, and won 22-18. Now 6-1, we faced the other 6-1 team, New Berlin West. With a fairly easy match ahead of us in the final match, we knew the NBW game would decide the conference. 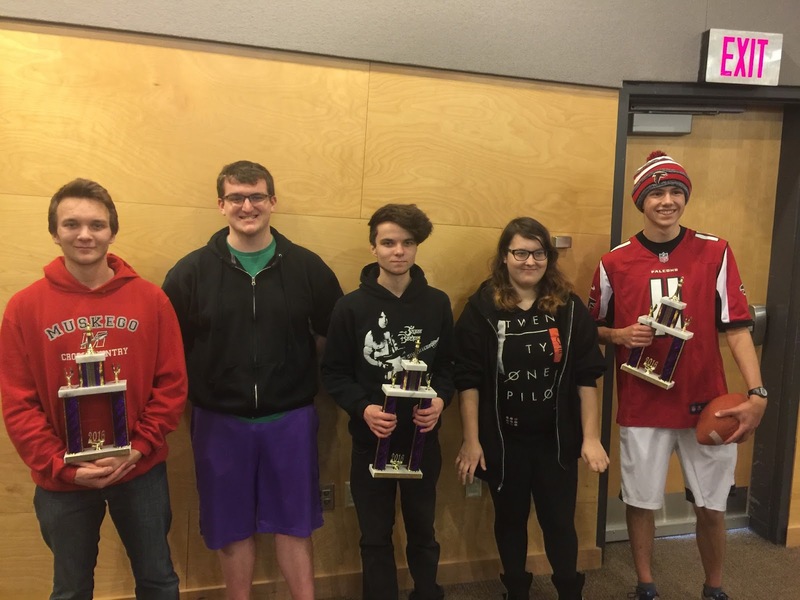 The MHS players won 4 out of 5 boards, then swept the final match to win the conference with a 8-1 record. Evan Seghers won the conference MVP trophy for the 2nd year in a row, and was 1st team all conference, as voted by Coaches. Jason Markowski and Reid Seghers were voted 2nd team all conference. Rachel Gomoll was honorable mention. We won the conference three years ago with a very similar team, then Brookfield Academy won the last two years. It's nice to bring the trophy home to Muskego! In JV, we had Will, Alyssa, Sam, David and Adam. Will went 3-0, Alyssa, Sam and David went 2-1, and Adam went 1-2. A great showing against mostly high school players! The future of the club is definitely bright. NEXT UP: Grade Level on Mar 5, and STATE Mar 19-20. Let us know if you'd like to go! The club had mixed success at ASA Clark, but everyone got at least a couple of wins and fought hard. Even if the wins aren't as frequent as some would like, playing in tournaments is what will get them there! Colton P was the loan club member in an always difficult K12 division. Lance M and Austin B were in the K6 unrated division and received medals for getting 3 points. In the K3 division we had Yashika P, Rishi S and Logan O who led the way and took forth place! Big thanks to Ryan O'Leary for helping to organize the club at ASA and keep track of the results! Next up - MSOE grade level on March 5th, but the least expensive registration fee is due by this Thursday the 25th. Last night was week #2 of our in-house 5 round tournament. I think the students are doing a great job and having fun! It also demonstrates that most of them really are ready for tournaments and could be playing in them. March 16 will be a pizza party to celebrate the year! Leah will have more details in the next weeks. March 23 will be our last class ! Speaking of tournaments, there are only a few remaining! This Saturday is one of Mr. Matt's tournaments at ASA Clark - sign up by tonight! good opportunity to play other kids ONLY in your own grade! note - you need to register online and early for this one. In order to have the cheapest rate of $20, you must be registered by next Thursday the 25th. Saturday March 19/ Sunday March 20 is UW Oshkosh State Tournament. If you have any questions about this one let me know! It's been a great season so far, but let's keep it going during this home stretch and practice, practice, practice and play play play! The Spring Merchandise Flyer is here. If you'd like to see it before next wk's class, please email me at leahmike@ymail.com. The deadline to have the orders is February 24. I accept cash, check & Pay pal. IN CLASS Tournament starts Wednesday! Our annual in-class tournament starts this Wednesday, April 10! We will have ONE GAME PER WEEK (following a short lesson), for 5 weeks. At the end, we will crown a champion for K-4, K-8, and K-12! Champions will get trophies. We will also be giving awards for top teams by school. CLICK HERE TO REGISTER so we know how many to plan for! Mr. Matt has to set up the pairings in advance! You can also click the red button on the right hand side of this website. Big Group at Bethlehem ! The MSCC brought a large group to the Star of Bethlehem Tournament today in New Berlin, run by Mr. Matt. It was really nice to have a club that brought 20 players to the 4 divisions and we had a great time! We also had a couple of players switch divisions at the last minute, just so that they could help make a team. Way to go Logan and Peter for switching divisions and playing "up" to help the team! 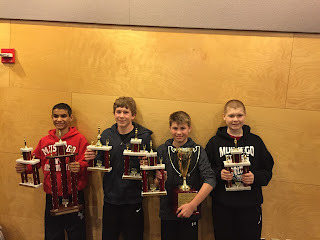 - The team of Nelson, Dale E, Peter M and Logan O took the 3rd place team trophy! 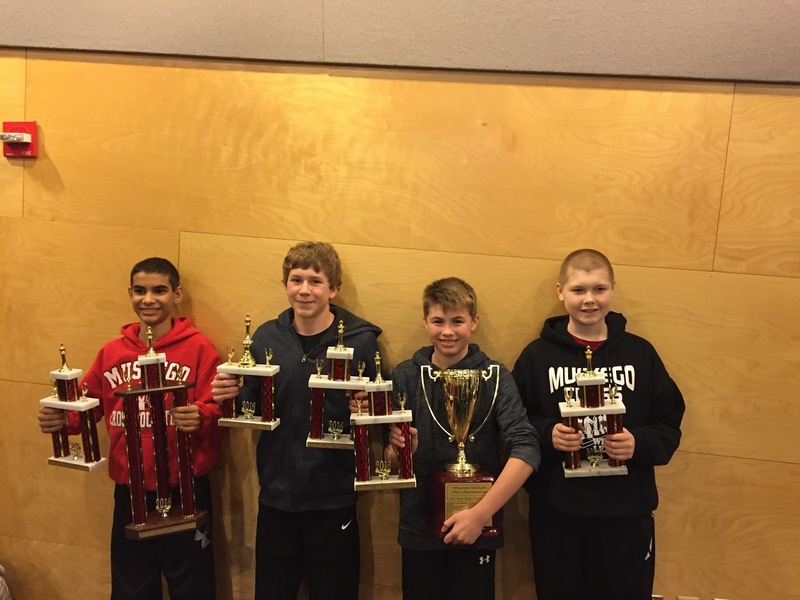 - The team of Will, Aaron G, Nick S, Colton P and Kenny M took the 1st place team trophy!